Is Halloween Pagan in its Origin? Is Halloween, a pagan festival, originally just a harmless time of fun or is there something much more sinister involved? Where did it come from? 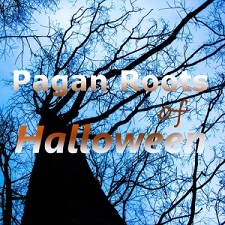 The first article below "The Pagan Roots of Halloween" documents how it actually started. There is much in our society that comes from paganism, from turning away from God and many of the other problems reported in this newsletter and from month to month are a result of people rejecting the God of the Bible. 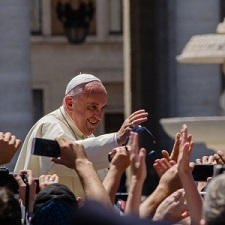 The last article shows how even the pope has turned away from the Biblical account of creation to embrace evolution. Halloween, the pagan feast that is the most obvious is only the tip of the iceberg in terms of what is wrong with our so-called Christian society. Note that I am simply sharing items of interest. That does not imply that I agree with everything presented. Most people that celebrate Halloween have absolutely no idea what they are actually celebrating. Even though approximately 70 percent of Americans will participate in Halloween festivities once again this year, the vast majority of them are clueless about the fact that this is a holiday that is thousands of years old and that has deeply pagan roots. If you are going to celebrate something, shouldn't you at least know what you are celebrating? Before it was ever known as Halloween, this festival was known as Samhain. According to Wikipedia, Samhain "is mentioned in some of the earliest Irish literature and is known to have pre-Christian roots". The ancient Celts believed that Samhain was the time when the veil between the spirit world and our world was lifted and the ghosts of the dead were able to freely mingle with the living. It was also a time to honor the Lord of the Dead known as Bel (note the similarity to Baal) or Chrom. Almost every major Halloween tradition including the jack-o'-lantern, trick-or-treating and wearing costumes is rooted in ancient Celtic practices. In many areas of early America, Halloween was considered to be so evil that it was banned. But today most Americans don't even think twice about celebrating it. To most people these days, Halloween is just a fun time to dress up, eat candy and attend parties. But there are others that take this holiday extremely seriously. Reading through the latest report from the National Coalition for the Homeless might spark one of those moments when you wonder, what would Marie Antoinette say? French peasants who had no bread to eat were so enraged by rumors that their queen uttered the phrase "Let them eat cake" that she ended up decapitated. Well, the coalition's modern-day researchers found that since January 2013, 21 cities have restricted or flat-out banned feeding the homeless at all - and 10 municipalities have similar ordinances in the works. 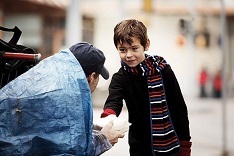 At the heart of the bans and restrictions, write the authors, is the misguided belief that feeding people who are sleeping on the streets or in shelters encourages homelessness. Apparently, some of our nation's politicians and policy makers are convinced that thousands of Americans are so eager for a free bowl from a soup kitchen that they'll quit their jobs and begin sleeping in doorways and on bus benches to get it. According to the report, a consultant on homelessness named Robert Marbut visited more than 60 communities in 2013 and 2014, giving talks about how dishing out hot meals to homeless people enables them to remain homeless. "If you feed people in parks or on a street, or drive your car up and give 14 meals out of the back of your car, all you're doing is growing homelessness," Marbut said in one speech, according to the report. The sickening transformation of these United States into an authoritarian police state with an incarceration rate that would make Joseph Stalin blush, has been a key theme of my writing since well before the launch of Liberty Blitzkrieg. 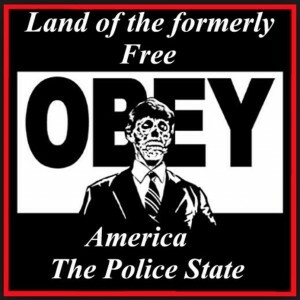 One of the posts that shocked and disturbed readers most, was published a little over a year ago titled: American Police Make an Arrest Every 2 Seconds in 2012. In the event you never read it, I suggest taking a look before tackling the rest of this piece. Fast forward to fall 2014, and the Wall Street Journal has a powerful article about how children in schools systems across the U.S. are being arrested or turned over to police custody for doing things that children have always done since the beginning of time. Things such as wearing too much perfume, sharing a classmates' chicken nuggets, throwing an eraser or chewing gum. As a result of our insane societal obsession with authority and disproportionate punishment, the WSJ reports that "nearly one out of every three American adults are on file in the FBI's master criminal database." A generation ago, school children caught fighting in the corridors, sassing a teacher or skipping class might have ended up in detention. Today, there's a good chance they will end up in police custody. In Texas, a student got a misdemeanor ticket for wearing too much perfume. In Wisconsin, a teen was charged with theft after sharing the chicken nuggets from a classmate's meal—the classmate was on lunch assistance and sharing it meant the teen had violated the law, authorities said. In Florida, a student conducted a science experiment before the authorization of her teacher; when it went awry she received a felony weapons charge. Over the past 20 years, prompted by changing police tactics and a zero-tolerance attitude toward small crimes, authorities have made more than a quarter of a billion arrests, the Federal Bureau of Investigation estimates. Nearly one out of every three American adults are on file in the FBI's master criminal database. Did you catch that too? "Zero-tolerance attitude toward small crimes." Indeed, the big criminals go to Wall Street, crash the economy and then receive trillions in taxpayer bailouts. Or they get a top job in the Obama Administration, such as Jedi-master of cronyism, Tim Geithner, being chosen as Treasury Secretary. At school, talking back or disrupting class can be called disorderly conduct, and a fight can lead to assault and battery charges, said Judith Browne Dianis, executive director of the Advancement Project, a national civil-rights group examining discipline procedures around the country. If these rules were in place in my day, I would have been arrested about 150 times. "We're not talking about criminal behavior," said Texas State Sen. John Whitmire, the Democratic chair of the senate's Criminal Justice Committee, who helped pass a new law last year that limits how police officers can ticket students. "I'm talking about school disciplinary issues, throwing an eraser, chewing gum, too much perfume, unbelievable violations" that were resulting in misdemeanor charges. According to the U.S. Education Department's Office of Civil Rights, 260,000 students were reported, or "referred" in the official language, to law enforcement by schools in 2012, the most-recent available data. "The U.S. is hardly alone when it comes to drought. "A worldwide weather phenomenon threatens the future of water and food supplies, as well as the global economy, experts say. Colombia, Pakistan, Somalia, Australia, Guatemala, China, and Kenya are just a few of the other countries suffering severe drought conditions. "Droughts have plagued the earth for centuries. "Cost projections from the drought are hard to pin down, but the World Economic Forum (WEF) says that drought across the globe costs six to eight billion dollars a year from losses in agriculture and related businesses. "In California alone, the well-documented drought will cost the state $2.2 billion and put some 17,000 agricultural workers out of a job this year, according to a study from the University of California, Davis. 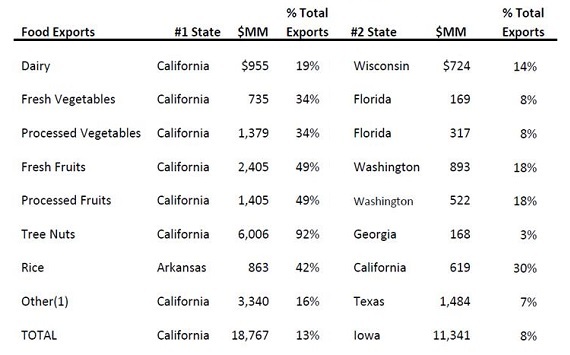 California is easily the biggest agriculture-producing state in the United States. "A lack of rain is scorching the southern and northern regions of China, where some of the lowest rainfall on record has cut corn and rice yields. "In Australia, livestock and agriculture production have declined. Eighty percent of Queensland, the second most populous state in Australia, is in drought. The country is also suffering from wildfire outbreaks due to the lack of rain. In Colombia, the government has established new water-rationing regulations in the coastal and Andean regions. The government there said the worst of the drought is 'yet to come.'" Everyone knows that California is a food powerhouse. What might be less known is just how dominant it is in certain crops. 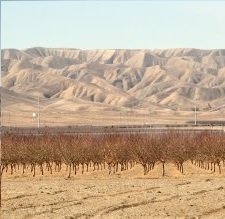 Now in its third year, the drought in California has forced local farmers to switch their water use from rivers and reservoirs, which are at historic low levels, to underground sources. This has mitigated substantial production losses, but given that underground reservoirs take a long time to replenish, if the drought continues the food situation in California might get much more dicey. 1) Includes live animals, other meats, animal parts, eggs, wine, beer, other beverages, coffee, cocoa, hops, nursery crops, inedible materials and prepared foods. Last July, a study on the effects of the drought on California's food production by the UC Davis Center for Watershed Sciences highlighted that "consumer food prices will be largely unaffected. Higher prices at the grocery store of high-value California crops like nuts, wine grapes and dairy foods are driven more by market demand than by the drought." However, looking at the table above, future production losses could extend to a wider variety of staples: California represents almost one-fifth of all US States' milk exports, a third of all vegetable and rice exports, almost half of all fruit exports and over 90% tree nut exports. What is equally striking is how distant the #2 States are in some cases in terms of production volumes. So if the drought continues into the foreseeable future (and this is a real possibility), here's a really interesting question: who will make up for any shortfall in California's gigantic contribution to US food production? Just when you think the situation can't get any worse, there's a new threat being announced by the Israeli News Agency. Imagine you're at a large public event with thousands of people attending when all of a sudden a Jihadists, infected with Ebola, detonates a bomb he is wearing. Now imagine a coordinated attack like this in multiple cities across the city within hours of each other. Many people will call this fear mongering or just plain crazy, but not so fast. As you will see in the latest video report by James O'keefe Viral Videos, access for ISIS/ISIL to enter the United States is virtually wide open. There are many ways ISIS/ISIL Jihadists can enter America. Canada allows British citizens to come in to that country with no passports or visa's. James O'Keefe actually takes a boat across the U.S border into Canada, picks up a man dressed as a ISIS/ISIL terrorist and brings him right back into the U.S. It is so fast and easy you won't believe what you are about to witness. Then there is this report from The Extinction Protocol where the Israeli News Agency, a site which claims to be Israel's first online news organization has confirmed the authenticity of the report saying it "clears all news items relating to Israeli security with the Israel government press office." The agency said, citing "Israeli security sources," that dozens of ISIS fighters in Syria have fallen ill and had symptoms of Ebola. This news quickly ignited a new conspiracy theory claiming that ISIS is planning to send Ebola-infected militants into the US to spread the disease. Ray's note: whether actual planning for such an act of terrorism is real or not, the thought has obviously occurred to people. I recently started investigating the nature of Ebola - a good defense, to know your enemy. There are some interesting connections with Vitamins C and K that I hope to compile information on and include in a future health newsletter from my health website. There may be good reason to prohibit western doctors from entering into these vulnerable villages in central Africa. The doctors come bearing unrecognized poisons in their effort to treat symptoms and save lives. The backfire treatment is revealed upon scrutiny of a review article of treatments for Ebola published in 2012. The symptoms of scurvy (frank vitamin c deficiency) and Ebola are very similar. These central African populations area already plagued by malnutrition. Is there anything visiting doctors bring with them that induces further depletion of vitamins C and K? The primary suspects agents are paracetamol (acetaminophen, aka Tylenol) and antibiotics. Up to 3 grams (3000 milligrams) a day of acetaminophen is given to Ebola patients to quell their raging fevers and only half of the patients given this anti-inflammatory drug survive Ebola. Acetaminophen depletes the body of glutathione, a key protective antioxidant. Vitamin C is required to maintain glutathione levels. [American Journal Clinical Nutrition July 1993]. Amoxycillin, ciprofloxacin (Cipro) and cenftriaxone (Rocephin) are antibiotics commonly prescribed for Ebola patients and are known to deplete vitamin K, a blood-clotting factor. Aspirin is not advised for Ebola patients because of the threat of bleeding. Yet antibiotics or anti-inflammatories that may interfere with blood clotting or induce a vitamin C deficiency that can result in uncontrolled hemorrhage are employed without hesitation. The symptoms caused by Ebola virus are similar to those caused by malaria which is also very common in Central America. When Ebola patients are misdiagnosed and given anti-malaria drugs, artemether/lumefantrine (Riamet/Coartem) and quinine the death rates are 67% and 100% respectively. Quinine depletes vitamin K.
Ray's note: I makes sense that there would be a connection to Vitamin K as that is so important in the clotting mechanism and Ebola is a hemorrhagic fever with so much bleeding. I have long been a believer in the benefits of having lots of greens in my diet and even also take a high-quality green product that is high in Vitamin K.
OTTAWA - Health Canada says more than 200 Canadians have been infected by a virus that has sickened hundreds of thousands of people in the Caribbean and spurred a state of emergency in Jamaica. As of Oct. 1, the agency said Tuesday, 201 Canadians had been infected with chikungunya (CHIK-un-gun-yah), a disease caused by a virus transmitted by mosquitoes. Symptoms include fever and severe joint pain, as well as muscle pain, headache, nausea, fatigue and rash. The cases have been confirmed "among travellers returning from endemic areas in 2014," said Eric Morrissette, a spokesman for Health Canada. The first case of the disease in the Western Hemisphere was documented on the island of St. Martin last December. Chikungunya has been present in Africa and the Asia-Pacific region for decades. "A very significant rise in infections by this virus has occurred in 2014, which is consistent with the large outbreak in the Caribbean region and ongoing activity in the Asia-Pacific area," Morrissette said. The majority of the Canadian cases stem from travel to Caribbean islands, he added. The area is a popular vacation destination for Canadian sun-seekers. There is no evidence of local transmission in Canada, since the two species of mosquitoes that transmit the virus aren't native to the country, Morrissette said. There have also been confirmed cases in the United States and Central and South America. Jamaican officials declared a state of emergency over the weekend as it grappled with chikungunya. Some estimate as much as 60 per cent of the Jamaican population has fallen ill with the virus. Almost 800,000 people have been infected in the Caribbean, the majority of them in the Dominican Republic. The country's health minister said last month that nearly 500,000 people there have battled chikungunya. Did you know that a storm 14 times larger than the Earth is happening on the sun right now? Earlier this week, it unleashed a flare which was a million times more powerful than all of the nuclear weapons in existence combined. Fortunately, that flare was not directed at us. 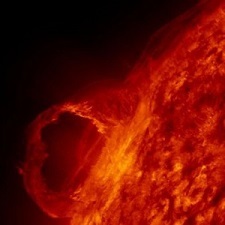 But now the area of the sun where this solar storm is located is rotating toward Earth. An eruption on the sun at just the right time and at just the right angle could result in a society-crippling electromagnetic pulse blasting this planet. So if your computers, cell phones and electronic equipment get fried at some point over the next few weeks, you will know what is probably to blame. Such an electromagnetic pulse has hit our planet before, and as you will read about below, some very prominent voices are warning that it will happen again. It is just a matter of time. Scientists tell us that the absolutely massive sunspot group that has recently formed on the sun is highly unusual. NASA has described it as "crackling" with magnetic energy. The mainstream media has not been paying too much attention to it, but this sunspot group is potentially extremely dangerous. The sunspot, a dark patch in the sun's photosphere, represents intense solar magnetism bursting from the sun's interior known as an active region. This particular active region, designated AR2192, has been rumbling with intense flare activity, recently exploding with 2 X-class flares, causing some short-lived high-frequency (HF) radio black outs around the globe. Such blackouts are triggered by the intense extreme ultraviolet and X-ray radiation that solar flares can generate, causing ionization effects in the Earth's upper atmosphere - a region known as the ionosphere. HF radio can be strongly hindered by this activity, triggering blackouts that can effect air traffic and amateur radio operators. The other day a flare erupted which did cause radio blackouts all over the world for a time. But we were fortunate that the flare was not directed at us. If it had been, the results could have potentially been catastrophic. Officials said there's nothing they can do to stop it, and they have no idea how much radiation is running into the ocean. The reactors didn't just suffer a melt down, or even a China syndrome type melt-through, but a series of melt outs. Scientists have no idea where the cores of the nuclear reactors are. Well actually, maybe they have found them ... scattered all over kingdom come. The Japanese have dumped their plan to build an "ice wall" around the plant to contain the radiation. Indeed, they don't have much of a plan to stabilize the reactors or contain the radiation. Their plan seems to be to dump it all in the ocean. Radiation from Japan's Fukushima nuclear disaster is approaching the West Coast, the Woods Hole Oceanographic Institution is reporting. A sample taken Aug. 2 about 1,200 kilometers west of Vancouver, B.C. tested positive for Cesium 134, the Fukushima "fingerprint" of Fukushima. It also showed higher-than-background levels of Cesium 137, another Fukushima isotope that already is present in the world's oceans from nuclear testing in the 1950s and 1960s. "There is definitely offshore Fukushima cesium now," Buesseler said. "It's not on the beaches, but it's offshore." Analysis: Israelis are fooling themselves if they think that the unrest in the Palestinian side, primarily over the Temple Mount, is just going to go away. How close did we come last week to witnessing a real fire break out inside the Al-Aqsa Mosque during the riots on the Temple Mount? Does anyone here even care at all? Not one bit. Oh, how sweet a winter slumber we are having. The al-Murabitun - those few dozen Palestinians, including some Israeli Arab members of the Islamic Movement, who have made themselves paid guardians of the Temple Mount against what they call "the Jewish takeover" - threw Molotov cocktails from inside the mosque. Israeli police responded with riot-dispersal means. Sparks flew everywhere. All that remained was for the carpets to catch alight, the mosque to go up in flames and the entire Muslim world - Shias and Sunnis as one - to forget their differences and come running. And here, on our side, they're playing it down. The unrest on the Temple Mount is subsiding, they tell us. Jews made pilgrimages to Jerusalem over the Sukkot holiday, so tensions rose somewhat. That's all. And because more Jews came to Jerusalem over the holiday, the police ruled that Muslims under the age of 50 would not be allowed on the Temple Mount during the visiting hours of the Jews. Yes, it's true, members of the Temple Mount Faithful showed up too, there was some provocation, there were a few Knesset members there, they sang Hatikva a little alongside the mosque – but the status quo remained unchanged. It's all make-believe. We're fooling ourselves. This "status quo," which slowly moves all the time so as not to upset the extreme right, could end up not only giving rise to demonstrations in Jerusalem, but also to the toppling from his throne of the Jordanian king. And he is angry therefore with the government of Israel, which is playing with fire on the Temple Mount, but pretending that everything is under control. Ray's note: I read once the comparison that alliances in the Middle East shift "like the sands of the desert." The sentence in red above is significant in regard to that. Things could change very suddenly. And the west has had a history of arming both sides for decades. Daniel 8 will yet be fulfilled. Ray's note: This article goes on to give a list of "44 Reasons Why Evolution Is Just A Fairy Tale For Adults"
Roman Catholics acknowledge that the change of the Sabbath was made by their church, and declare that Protestants by observing the Sunday are recognizing her power. In the Catholic Catechism of Christian Religion, in answer to a question as to the day to be observed in obedience to the fourth commandment, this statement is made: "During the old law, Saturday was the day sanctified; but the church, instructed by Jesus Christ, and directed by the Spirit of God, has substituted Sunday for Saturday; so now we sanctify the first, not the seventh day. Sunday means, and now is, the day of the Lord." If you have ever wondered how Halloween, a blatantly pagan festival, has become so popular you might want to investigate some of the other days we celebrate - you might be very surprised.